For the first time in Canadian history, a Turkish citizen has been awarded a Medal of Bravery by the governor general of the country. Rıza Kaşıkçıoğlu became a local hero after he risked his life rescuing people from an apartment building in Alberta province's Edmonton, where he owns and operates a pizza shop. Kaşıkçıoğlu was working at Maximo's Pizza and Donair on Jan. 19, 2017, when he saw an apartment building across the street catch fire. He ran into the building, knocking on doors to warn residents and even carrying a disabled woman down seven flights of stairs. Kaşıkçıoğlu was able to rescue half a dozen people before fire crews arrived at the scene. One person died and five hundred were evacuated in the fire. 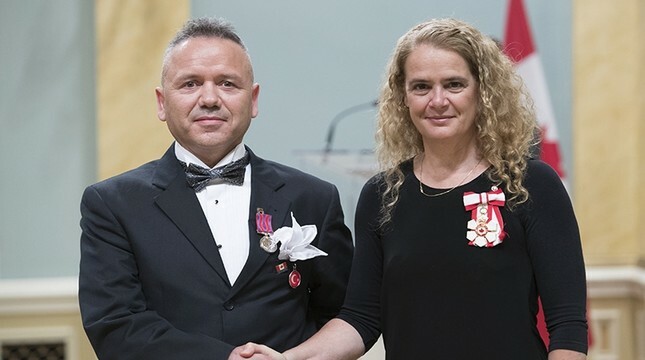 Governor General of Canada Julie Payette awarded the local hero with a medal for his bravery at a ceremony at the governor's official residence in the capital city of Ottawa. Turkey's Ambassador to Canada Selçuk Ünal as well as Kaşıkçıoğlu's wife and two sons also attended the ceremony. Despite suffering head and back injuries during the rescue, Kaşıkçıoğlu said "today I would never hesitate to do the same thing again." "Helping those in need is an essential part of being Turkish, our traditions and faith, and a command in Islam," he said. Kaşıkçıoğlu, who wore a Turkish flag on his jacket pocket during the ceremony, added that he was proud to receive the award "on behalf of the Turkish nation." A few months after the fire, Kaşıkçıoğlu found himself in need of assistance when doctors diagnosed him with a brain tumor. Surrounded by community support, he underwent surgery at the University of Alberta to remove a tumor and began the long road to recovery last December. Despite an outpouring of financial assistance from his community in Edmonton and the Turkish Canadian Society, Kaşıkçıoğlu was forced to put his pizza shop up for sale in April, finding the long hours on his feet too hard on his health. The community continues to support Kaşıkçıoğlu and his family as they press forward with courage. The Medal of Bravery is the third highest courage award in the Canadian system of honors. The medal, created in 1972, honors both living and deceased individuals for "acts of bravery in hazardous circumstances."